K-HIT 107-5 has your shot at experiencing Steely Dan in Las Vegas! 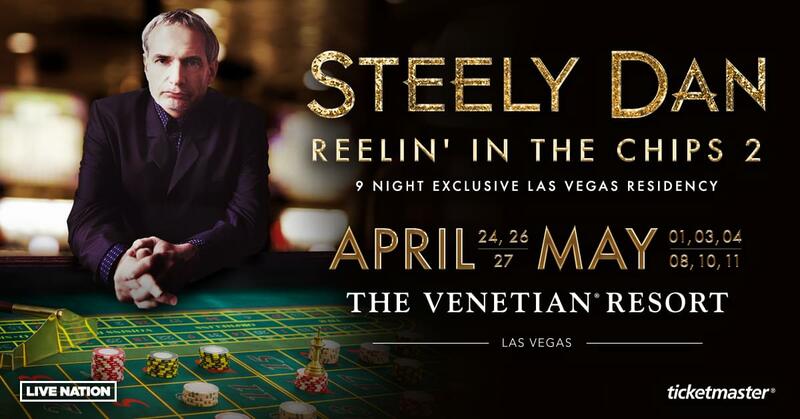 Steely Dan: Reelin’ In The Chips 2 Las Vegas Residency live at The Venetian Theatre at The Venetian Resort Las Vegas April 24 – May 11. Tickets on sale now at – click here to purchase! To qualify to win, listen to Tim Tyler weekday mornings April 8 – 19, 2019. A total of 10 qualifiers will be selected and on April 22, 2019 at approx. 10:00am we will randomly select one winner from all qualifiers to receive the grand prize. Tickets can be purchased on line at www.ticketmaster.com/steelydan , at any box office at The Venetian or The Palazzo or by calling (866)641-7469. Located in the heart of the Las Vegas Strip, The Venetian Resort Las Vegas features all-suite accommodations, exquisite restaurants and world-class entertainment and shopping. The luxury resort offers elegant suites, including standard suites that are nearly double the size of the average Las Vegas hotel room. The Venetian is home to restaurants from celebrated chefs including Wolfgang Puck, Thomas Keller, Emeril Lagasse, Lorena Garcia and Buddy “Cake Boss” Valastro. The resort also features Canyon Ranch SpaClub; a five-acre pool and garden deck; TAO nightclub; the Grand Canal Shoppes retail and dining mecca; a 120,000-square-foot casino and poker room; and more than 2.25 million square feet of meeting and convention space. For more information, visit venetian.com. The Venetian Resort Las Vegas is a property of global integrated resorts developer Las Vegas Sands Corp (NYSE: LVS).